President Donald Trump’s public feud with a top Republican on Capitol Hill has entered the name-calling phase. The President, a politician whose mantra has long been to hit back harder than someone hits him, is now treating Corker like he did his primary opponents: By giving him a nickname. A transcript of the conversation, however, shows that the newspaper did not set Corker up and that the senator was well aware that he was on the record. Trump continued his feud with Corker during a Tuesday meeting with former Secretary of State Henry Kissinger, pushing back on the senator’s statement that Trump is putting the United States on a path toward World War III. Trump labeling Corker “liddle” is a throwback to the 2016 campaign, when he gave Sen. Marco Rubio, R-Florida, then a presidential candidate himself, the same moniker. 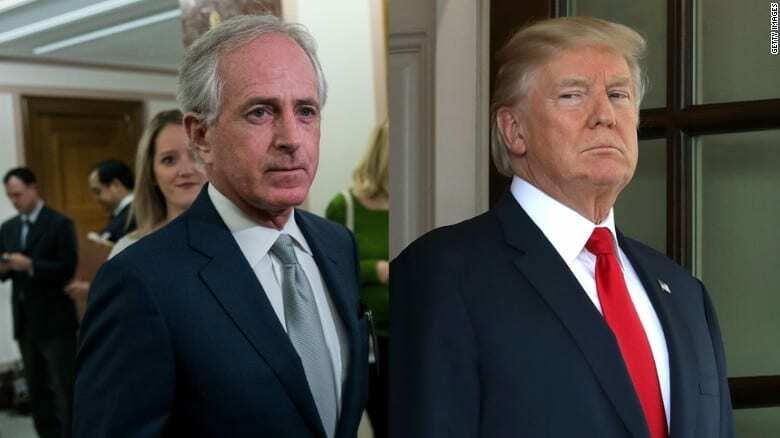 The feud between Corker and Trump had escalated this weekend when the President tweeted that the outgoing senator “begged” for his endorsement before declining to run for re-election. Todd Womack, Corker’s chief of staff, denied the claim later in the day. “The President called Senator Corker on Monday afternoon and asked him to reconsider his decision not to seek re-election and reaffirmed that he would have endorsed him, as he has said many times,” Womack said in a statement. The clash between Corker and Trump highlights fraying relations between the President and the men and women in Congress who the White House needs to deliver on the agenda Trump ran on. Trump has yet to score a signature legislative victory, a black mark on his record given his party controls both the Senate and House. Trump said Tuesday that he didn’t think his feud with Corker would imperil his tax cut plan. Corker’s comments have already infuriated Trump’s base. Steve Bannon, Trump’s former chief strategist who was let go from the White House earlier this year, called on the senator to resign in response. “If Bob Corker has any honor, any decency, he should resign immediately,” Bannon said in an interview with Fox News’ Sean Hannity on Monday night.